Sometimes, Bernie Sanders is too busy for Twitter so sometimes Twitter comes to him. In politics especially, circumstance and fate can be cruel or monstrously ironic. But every once in a great while, it also shows its whimsical side. This is a shot of Senator Sanders in Portland, Oregon yesterday and, out of nowhere, this adorable little bird just landed on his podium. It put us back in mind of the human element of political campaigning. 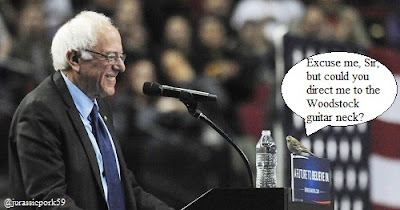 In simply alighting on Bernie's podium yesterday, that adorable little bird interjected a whimsical, spontaneous moment that let us laugh without bitterness of the entire silliness of it all. It created a #1 hashtag, #BirdieSanders and another one, #FeeltheBird. And Sen. Sanders recovered very nicely by adlibbing, "It may not have looked like it, but that little bird was actually a dove. And he was calling for world peace. No more wars!" Trump? He's not as comfortable as Sanders with the ornithological branch of the animal kingdom. 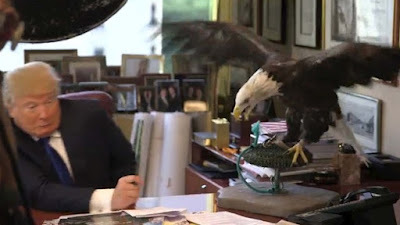 Of course, if the little guy had landed on Trump's podium, the Secret Service would've piled on him and, to use Trump's phrase, been carried out on a stretcher straight to his dinner plate. Hate Means Never Having to Say "I'm Sorry."